Chris Chelios was the captain of the US Olympic Hockey Team that played at the 2006 Winter Olympics in Torino, Italy. By participating in ice hockey at the 2006 Winter Olympics, Chelios set a new standard, by becoming the first player to take part in an Olympic ice hockey tournament, twenty-two years after he played in his first. 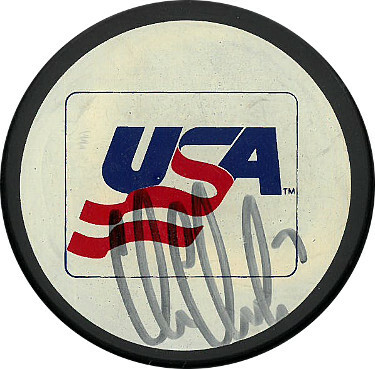 Chris Chelios has hand signed this Team USA Logo Hockey Puck. Certificate of Authenticity from Athlon Sports Collectibles.